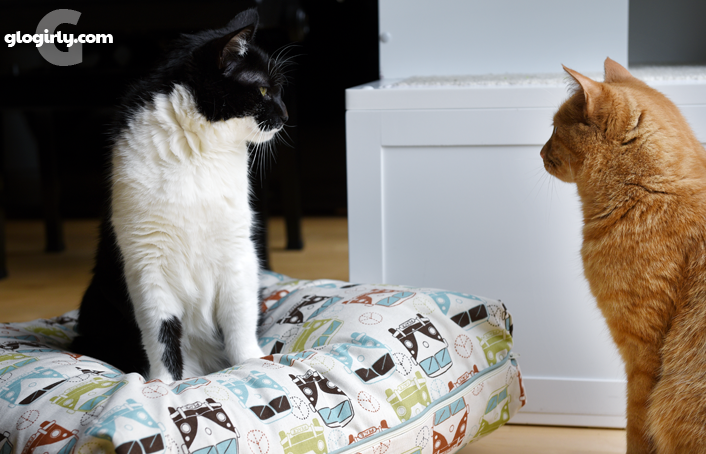 WAFFLES: Hey Boss, did we get a new bed? KATIE: Well you're half right, Waffles. It's a new bed. But it's mine. WAFFLES: Are you sure??? Because it looks like it's mine. KATIE: Does it say Waffles on it? WAFFLES: No. I think it says PEACE. KATIE: Well then it's DEFINITELY not yours. Comfy, cushy, stylish... this has my name written all over it. WAFFLES: But it doesn't say Boss either. KATIE: That's what you think, Waffles. You probably recognize the name PEACH from numerous blog features we've published here on GLOGIRLY. They make those cool kitty loungers you often see in our photos. From the moment we were first introduced to Georgia & Mike Barbush, the the registered vet tech and industrial designer team behind these beautiful products, we knew this was a very special company with a lot of heart. 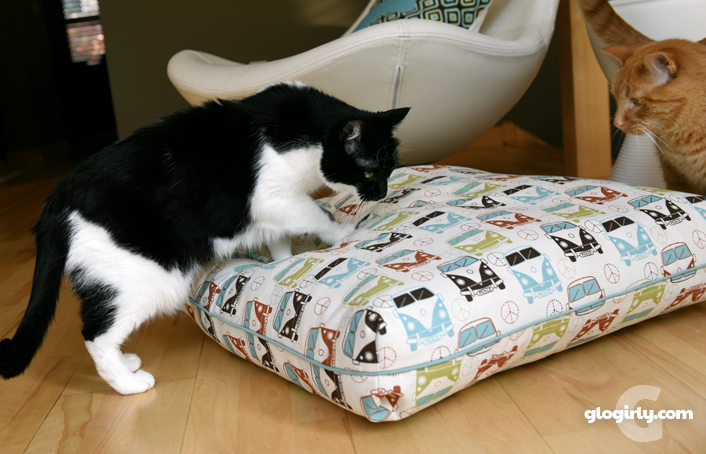 Their newest design, the Peach Pillow Bed, has quickly become another one of our favorites. The fun, modern fabric is a perfect accent to the Townhouse decor. 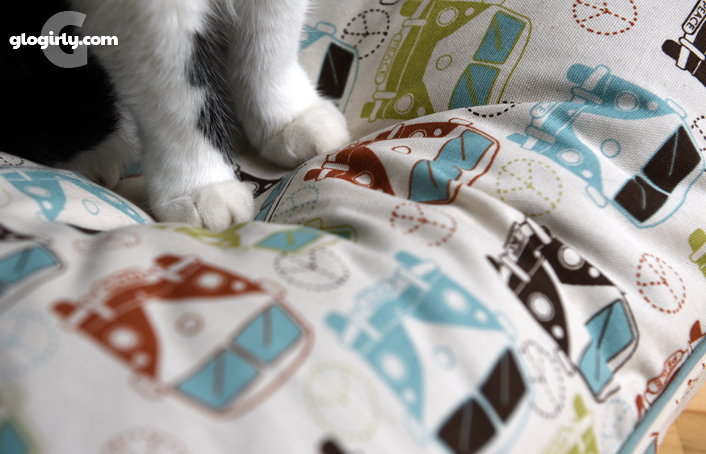 There are 12 to choose from and they all coordinate with the kitty lounger fabrics. Peach knows how to keep us cats in style! They're beautifully constructed with contrasting tape trim and a zipper closure allows for easy cleaning. Just machine wash the cover and it will be just like new. This is Katie's newest go-to bed. 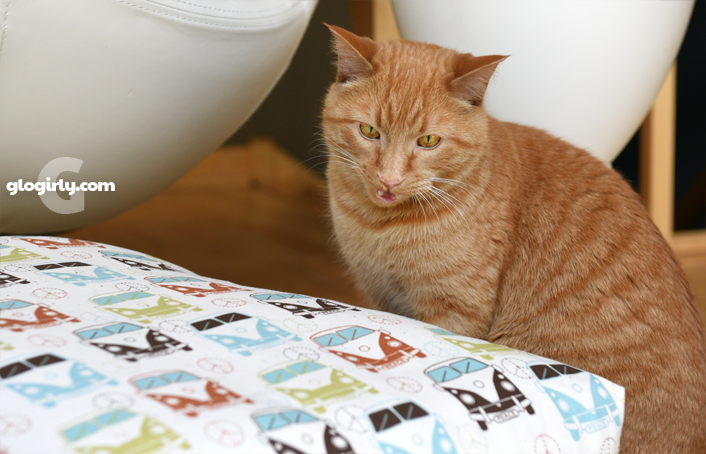 In fact, Waffles has barely had a chance to try it out because it always seems to be occupied. Understand that Katie is typically very slow to adopt a new piece of cat furniture and make it her own. Sometimes it can take a couple of months, a few weeks... but she made it known that the new pillow bed was hers in about two days. Each of their designs are not only thoughtful, functional and beautiful, they take great care in using materials that are eco-friendly and kind to our animals and our world. Georgia and Mike know their pets are very lucky to live in a house full of cool beds and daily doses of treats, chin scratches, and cuddles. But they also know there are many animals who don't have a family to love and care for them. They want to do what they can to help those animals out and their Kickstarter campaign is a perfect opportunity to do just that. For every backer at every reward level they are going to personally deliver a treat to a shelter pet. They''ll be dropping off some nifty Peach Pet swag for the shelter to use too. But the fun doesn't stop there. Treats for a day are nice, but treats and love for a lifetime are so much better! Georgia and Mike are going to make a video of their Treat Delivery Day to share with all of you and that you can share with your friends too. The video is going to have details about the shelters they visit and the adoptable animals they meet. They'll be posting info on their Instagram, Facebook, and Twitter accounts too. Their hope is to help as many animals find happy homes as they can. Pet people LOVE Peach. Within just 21 hours, they'd met their first goal! That means these awesome beds are going to happen! 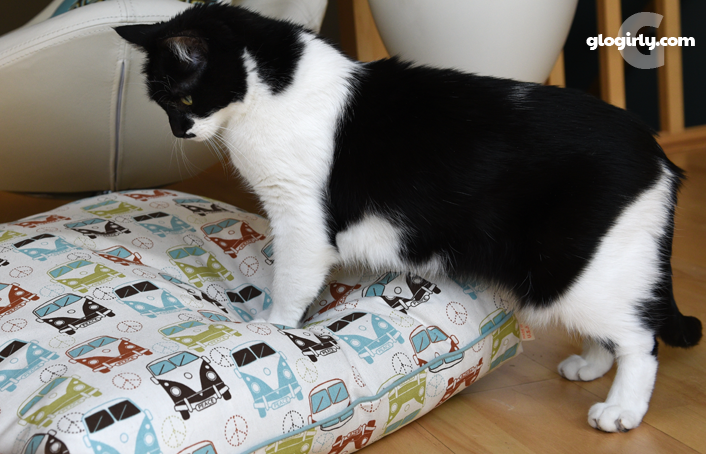 Now they're shooting for their stretch goal so there's still plenty of time to join in, support the project, get a pillow bed at an awesome price, and share a little joy with some shelters. WAFFLES: So Boss, are you super-double-extra-SURE that's not supposed to be my bed? FTC Disclosure: This post is sponsored by Peach Pet Provisions, which means that I was paid to feature this content. Regardless of payment received, all sponsored posts on GLOGIRLY will always reflect our honest opinions and feature products we use and love or believe would be relevant to our friends and readers. I'm loving today's post! It's peachy keen! What a great Kickstarter idea with a great big heart! I'm sure to check it out. I hope Peach delivers to Canada because Frank, Jack, Ben and Samantha will love to claim that beautiful pillow bed as their own! I'll have to buy most than one! Yup! Peach delivers to Canada! The link to the Kickstarter project doesn't work?? We've fixed it so it now works. Cool bed! How awesome that the Peach humans met their Kickstarter goal so fast! Too cool! Katie, you go girl!!! That looks like a comfy pillow for sure. We will check it out. That looks really nice. We are getting a hammock in that material. Looks like a very comfy pillow. 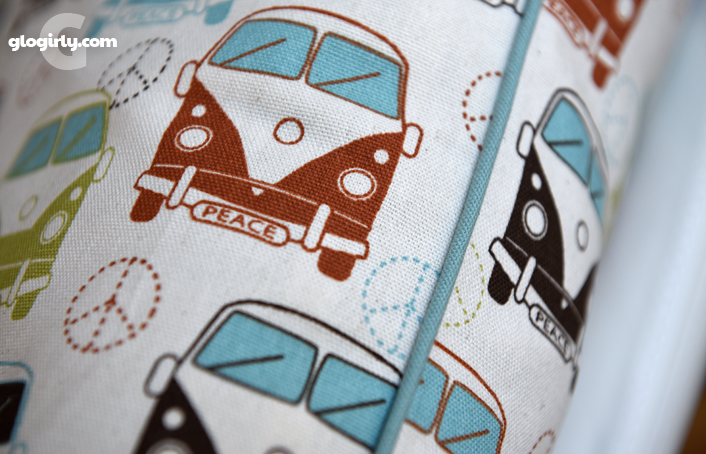 We like the chevron design, although the VW bus is cool. That is a great bed and Katie, I think Waffles could fit right next to you on there. I will check out their Kickstarter, it sounds like a good company. Very cute bed! 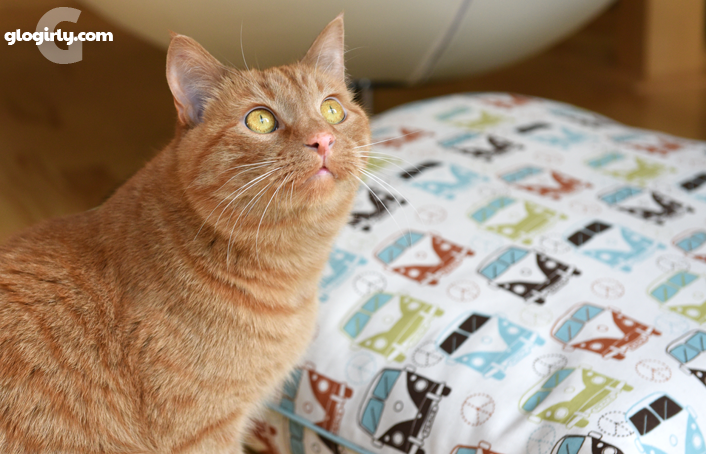 It would be purrfect to take with you when you go on your road trips. 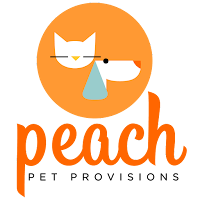 It's nice that Peach is giving back to shelter pets. All pets deserve comforty and love. What a cute bed! I love the print and the fact that is washable is definitively a plus. Katie, that sounds like a ringing endorsement. Do I see TWO Peach beds in the future? Wow dat looks weally nice. We wuld luv one of those. Course weez luv everyfin' yous showed us fwum them. Maybe sumday mommy can get us sumfin'. 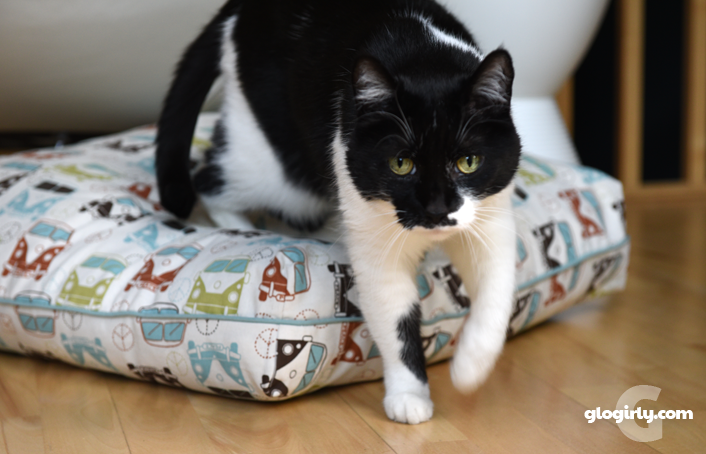 Y'all have a pawsum day and enjoy yous new cat bed. What an adorable print! 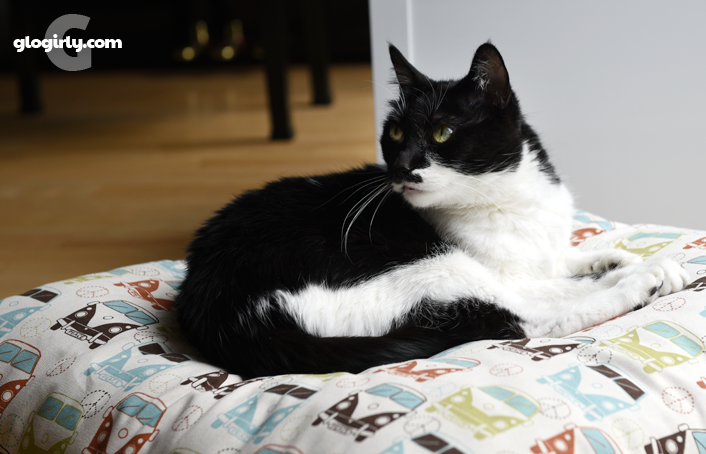 It's great to see Katie laying claim to the cat bed. Boss feeling good and in charge! That is a very comfy looking bed. Maybe Waffles will need one of his own. Peach Pet Provisions is just the greatest. Truffles still practically lives in her lounger! THAT’S the small? It’s HUGE! TW was surprised at how tiny Katie was the one time she glimpsed her at the conference. Anyway, way to go, Katie, in claiming that neat pillow for your own. Mum has made a pillow bed for me, plus the pod she won way back. So we are good with beds. Alright Katie..you look gorgeous lying on that VW bed!! Meowm just went over and backed them!!!! !